Mike and I had been married a couple of years when we moved to the Chicago suburbs. This is where I had my first taste of a Kaiser roll. I fell in love with these hard rolls and have loved them ever since. I love crusty chewy rolls; I think they’re perfect for most sandwiches. When I was looking for a roll recipe to serve my grilled chicken breast from a couple of posts ago I ran across a recipe for these lovely rolls and thought that they would be perfect. The rolls were not quite as crusty and chewy as I thought that they would be. They were just a little bit of a softer roll than the Kaiser rolls that I have purchased, but even though they made a terrific sandwich. 1. In a large bowl, dissolve yeast in 1/2 cup warm water. Add 1 tablespoon sugar; let stand for 5 minutes. Add the oil, salt, remaining warm water and sugar and 4 cups flour. Beat until smooth. Stir in enough remaining flour to form a soft dough. 2. Knead dough until smooth and elastic, about 6-8 minutes. Grease the bottom of the bowl, turning once to grease top. Cover and let rise in a warm place until doubled, about 1 hour. 3. Punch dough down and divide into 16 pieces. Shape each into a ball. Place 2 inches apart on a greased baking sheets. Flatten a little with palm of your hand. Cover and let rise until doubled, about 30 minutes. Beat egg white and cold water; brush over rolls. Sprinkle with poppy seeds or with sesame seeds. With a scissors, cut a 1/4 inch deep cross on tops of rolls. 4. Bake at 400 degree F for 15 to 20 minutes or until golden brown. Remove from pans to wire racks to cool. I think my husband would love these with poppy seeds! I love how chewy Kaiser rolls are. If it ever cools down a bit, I’m going to have to give these a try! Yum. They look perfect & super delicious. 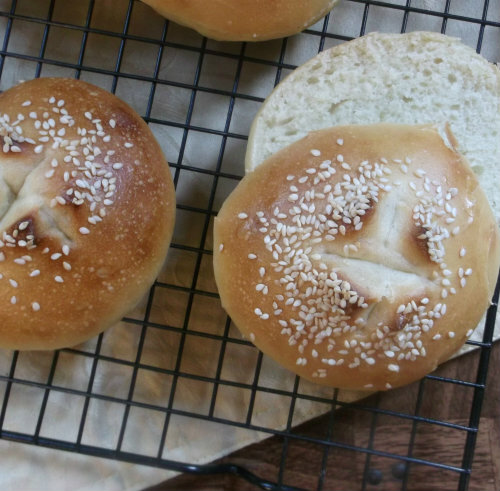 i grew up with Kaiser Rolls and there’s nothing like them for a sandwich. Yours are beautiful. 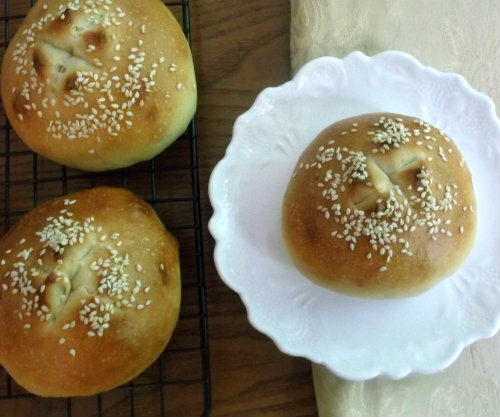 Your Kaiser rolls look awesome…nothing like home baked rolls. 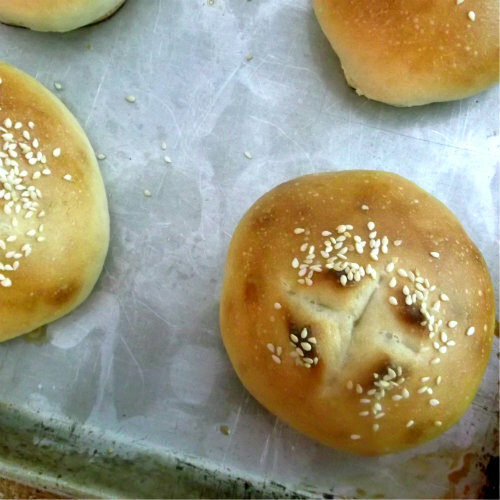 Kaiser rolls are great, and you did a wonderful job with them. I actually like them better for hamburgers than actual hamburger buns (although a good potato-based hamburger bun is wonderful). Good stuff – thanks!